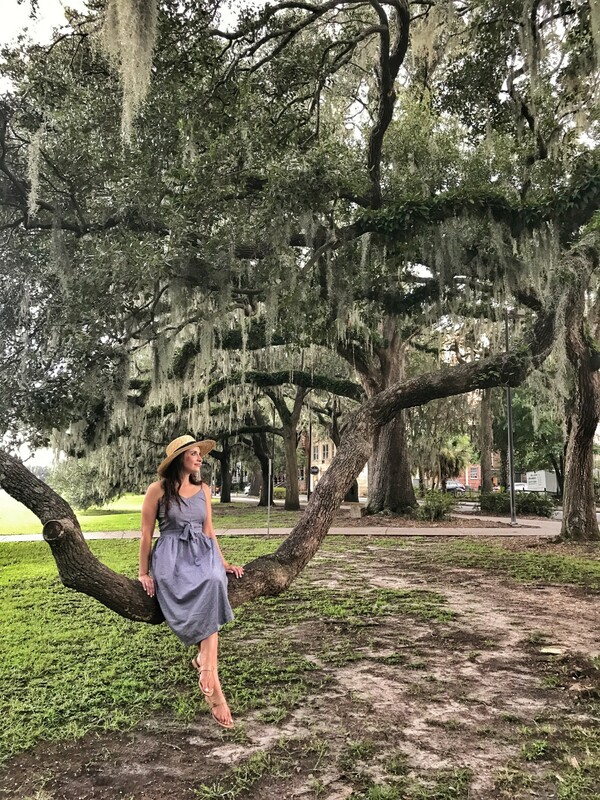 When we booked our September trip to Savannah, Georgia, my mind was flooded with visions of dreamy Spanish moss, lush green parks, and undeniable Southern charm. 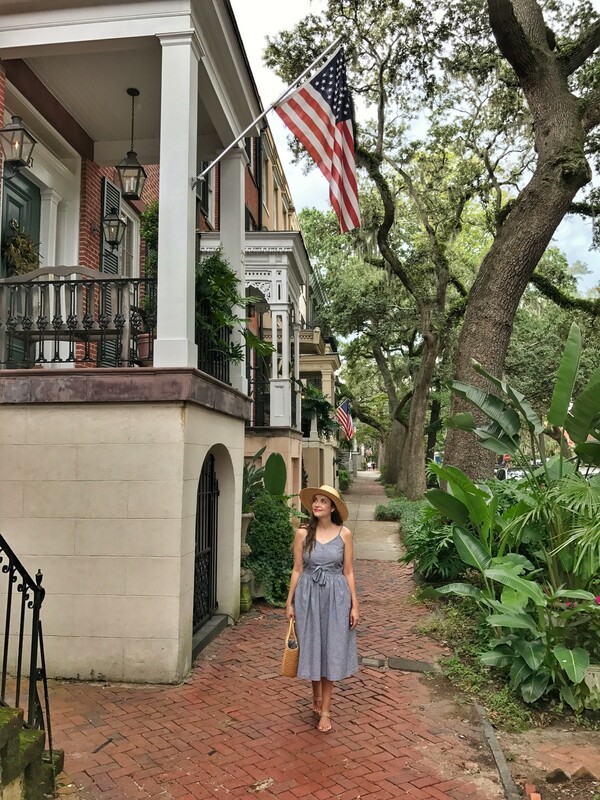 As the oldest city in Georgia, Savannah is filled with gorgeous architecture and rich history, so I knew that I would fall in love with it! From Boston, Savannah is an easy, two hour direct flight, making it the perfect place to visit over a long weekend. Over a two to three day period, you’ll be able to see all of the key attractions, while still being able to enjoy your vacation at a leisurely pace. 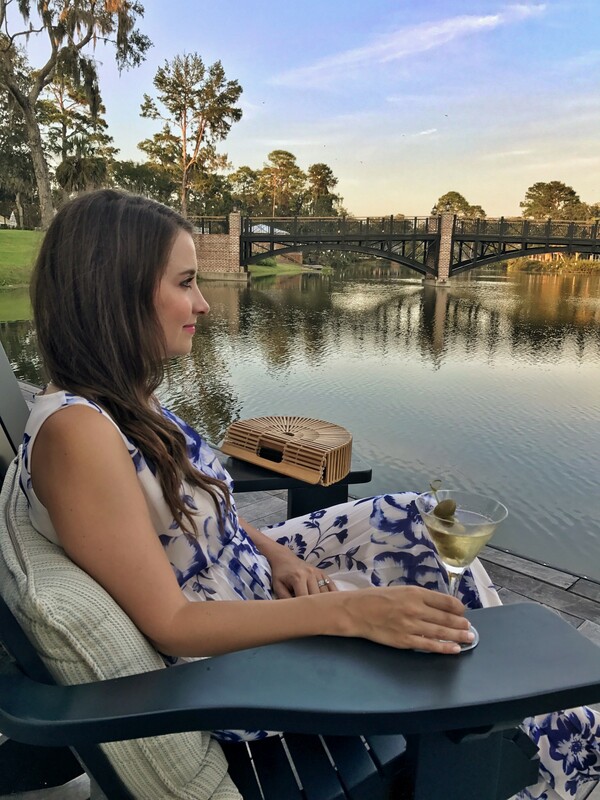 If you’re considering a vacation to Savannah, Georgia, I’ve compiled a list of my recommendations on how to spend a weekend in this beautiful Southern city. 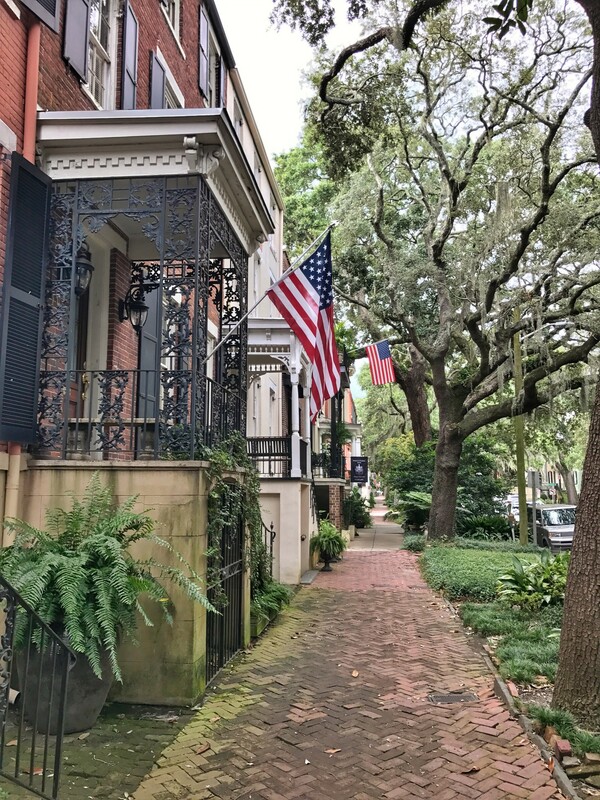 With its cobblestone streets and enviable gardens, Savannah’s historic district was one of my favorite areas to explore. We even made it a point to walk down Jones Street, which is frequently referred to as the “most beautiful street in America,” several times a day! Each home is more lovely than the last with many boasting gorgeous back gardens that you can sneak a peek at through ornate iron gates. 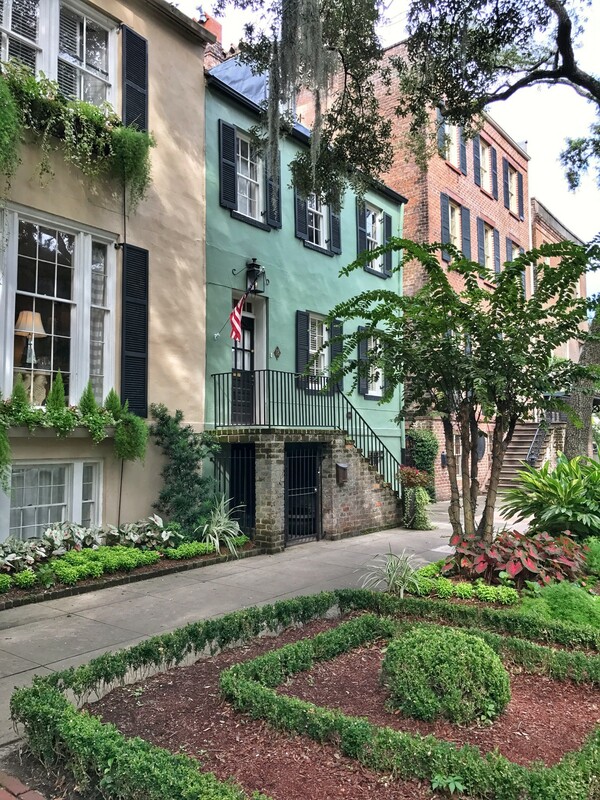 As you explore the historic district, there are a few homes that you should make sure to walk by; the birthplace of Juliette Gordon Low, the Founder of the Girl Scouts, the Mercer-Williams house, famously associated with the book, “Midnight in the Garden of Good and Evil,” and the Owens-Thomas house, which is a great example of English Regency architecture. Savannah is home to 22 beautiful green squares, which are strategically placed throughout the heart of the city. With the city’s hot temperatures and high humidity, they were the perfect place to take a quick break in the shade! All of the squares are surrounded by beautiful homes, churches, eateries, and adorable little shops (think independent book stores, high-end antiques!) and are home to grand statues, fountains, and plenty of benches. My favorite squares were Chippewa Square, which was featured in the movie, Forrest Gump, Calhoun Square, and Monterey Square, but all of the squares were equally as stunning and lush! Savannah’s squares are what make it so beautiful and it’s amazing to think that its founder, James Oglethorpe, had the vision to incorporate them into the city’s layout back in the 1700’s. Since Savannah is widely considered one of the most haunted cities in the United States, I knew we had to incorporate something ghost-related into our visit there. 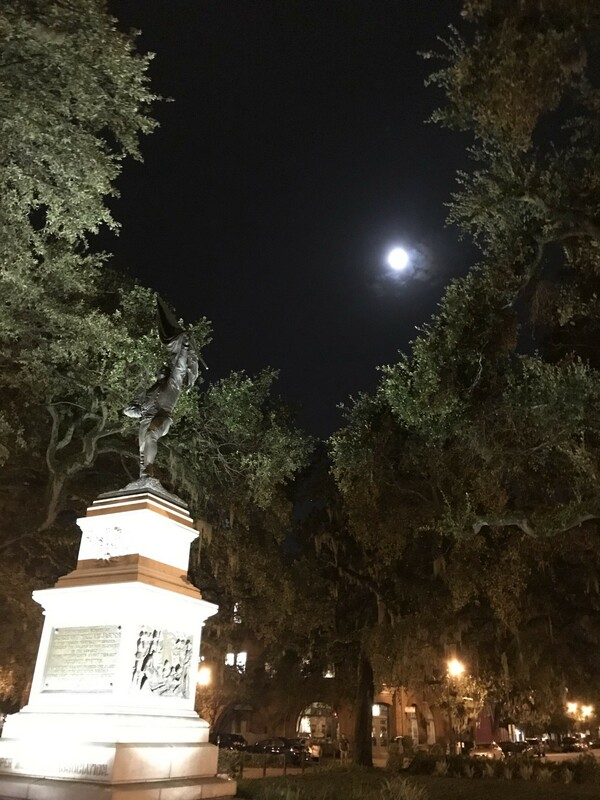 There are several companies that host organized ghost tours, either on foot or in a trolley/carriage, and we decided to go with Blue Orb’s “Zombie Ghost Tour,” which was a two hour walking tour. 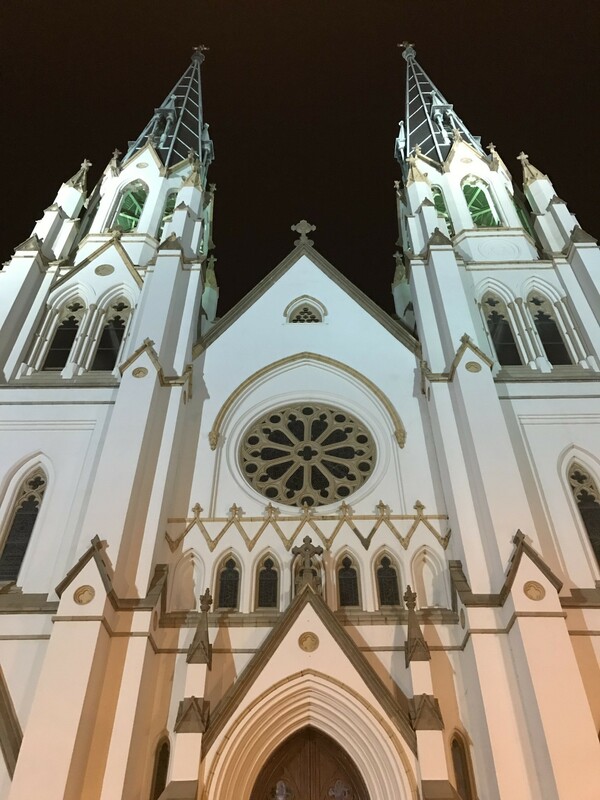 It was fun to explore the city at night, as it was less crowded and pleasantly cooler, and if you love history, you’ll enjoy hearing the stories about Savannah’s “ghosts.” While we didn’t have any official sightings on our tour, it was still eerie and very informative! Forsyth Park is the perfect place to have an afternoon picnic beneath a canopy of oak trees. 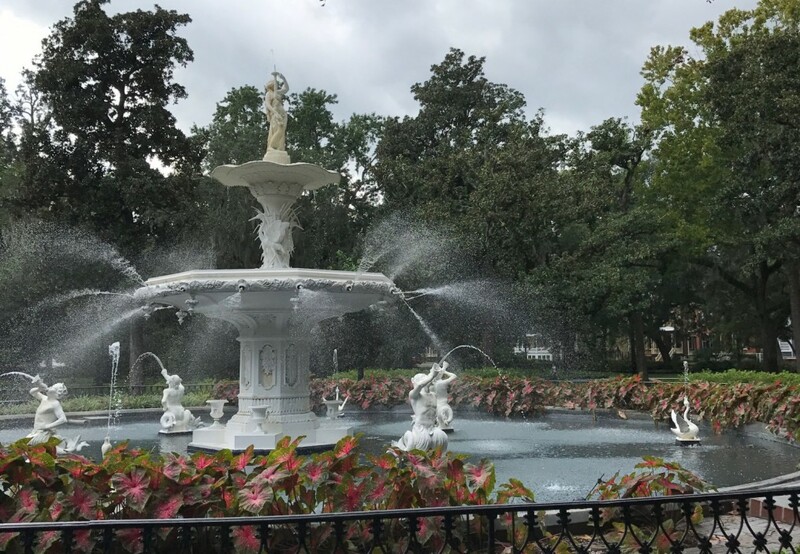 Known for its gorgeous fountain, Forsyth Park offers plenty of space to enjoy a picnic, and with Savannah’s open container law, you can even pack your favorite beverage! To make your picnic spread even better, pick up a few local treats like some honey from Savannah Bee Company (make sure to visit their store and do a honey tasting), macarons from the Paris Market (the cutest little shop with imported European goods), and if you have a cooler and LOTS of ice, a pint of ice cream from Leopold’s! 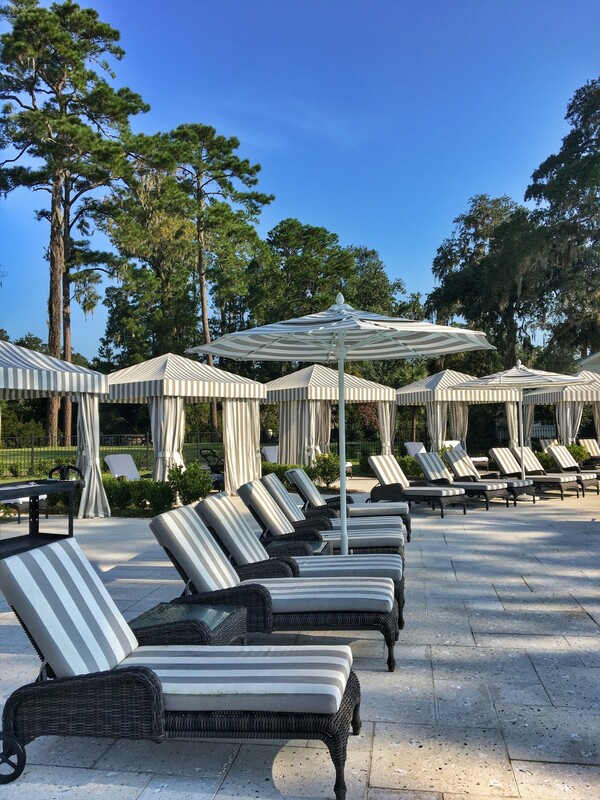 Savannah is only a 45 minute drive to peaceful Palmetto Bluff, South Carolina, and if you need a break from the city, the riverfront property of the luxurious Montage Palmetto Bluff resort is the perfect destination. 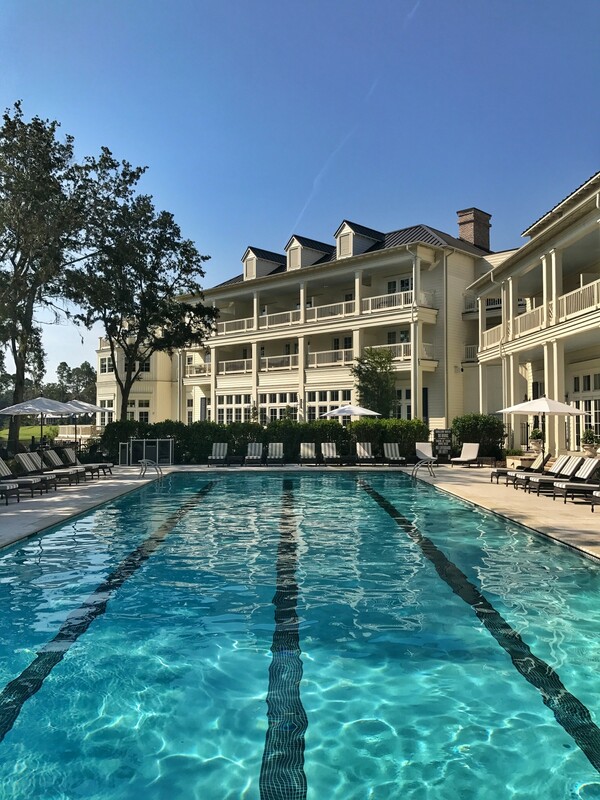 Since we did not rent a car, we took a scenic 45 minute UBER ride to the property, and relied on the resort’s trusty bicycles and golf carts while on the property. 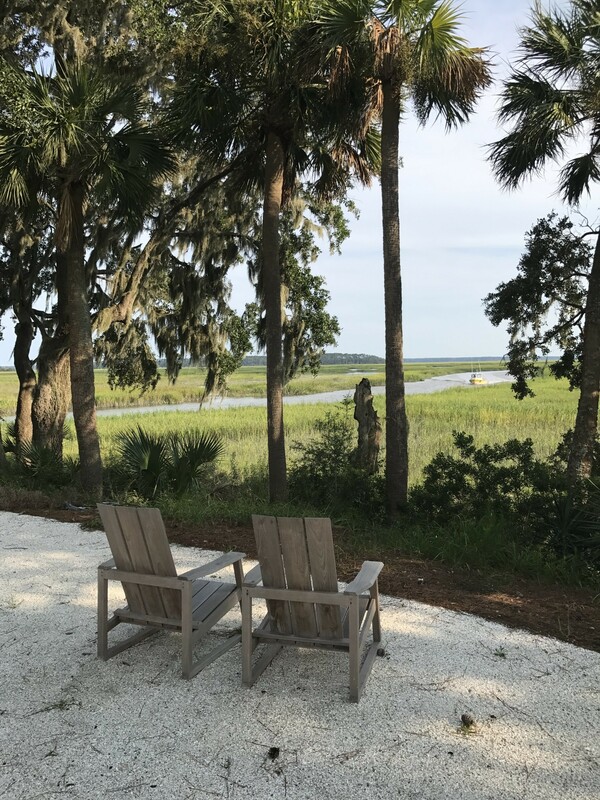 If you have a few extra days, I highly recommend a visit to this serene Lowcountry destination, or alternatively, you could stay here for your visit and do day trips to Savannah. 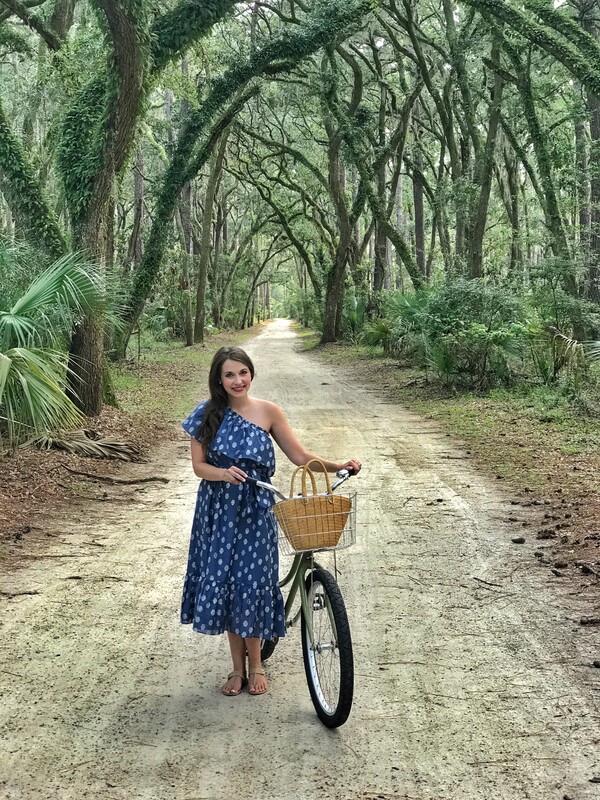 While in Palmetto Bluff, make sure to take a bike ride to Moreland Village. After biking on a dirt road under the most gorgeous oak trees, you can relax in hammocks overlooking untouched marshland. 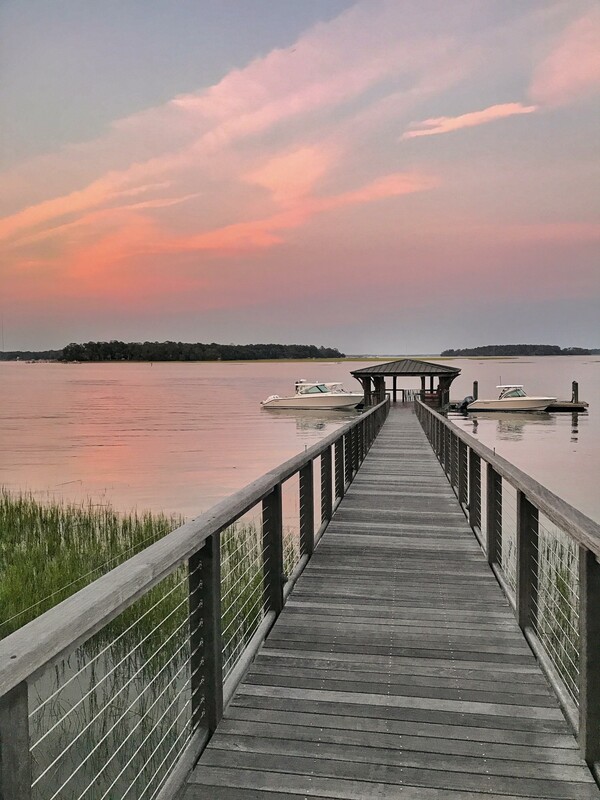 This part of our trip truly felt like a vacation; from roasting s’mores after dinner to watching sunsets over the May River, we didn’t want to leave! Bring bug spray! Both Savannah and Palmetto Bluff had quite a few insects, so it is a good idea to always have some bug repellent handy! If you’re thinking about booking a dinner reservation at the famed Olde Pink House, request the two-person table in the restaurant’s wine cellar. It’s dimly lit, super exclusive, and totally romantic! 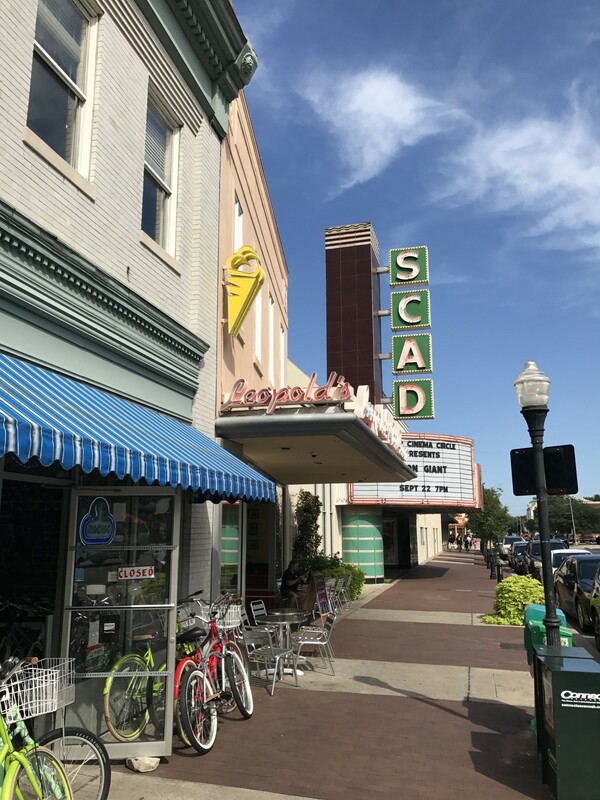 When researching hotels in Savannah, I would recommend concentrating your search in the historic district or riverfront area, as everything you’ll want to see and do is within walking distance from these sections of town. If you stay in this area, you definitely do not need to spend money on a rent-a-car! 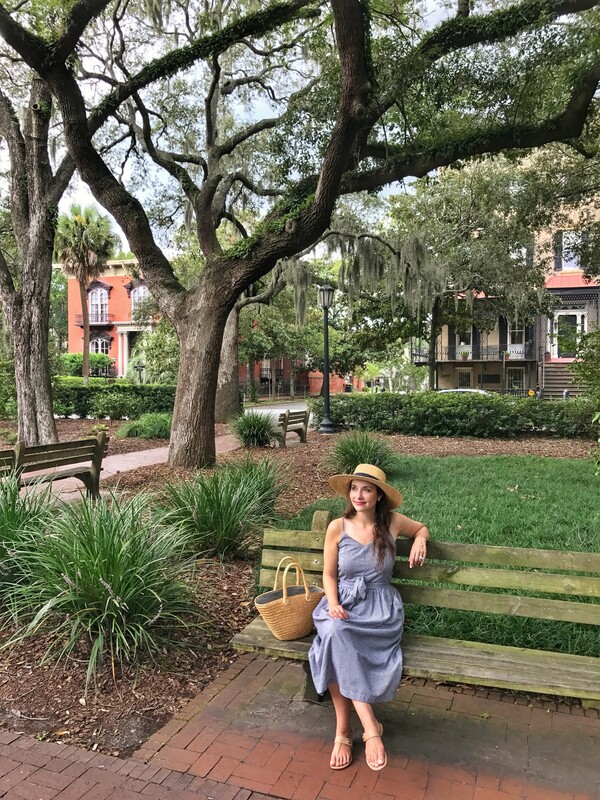 Savannah was incredibly hot and humid in early September, so if you love the heat, you’ll be in heaven, but if you’re like my husband, you’ll want to stay inside in the air conditioning all day! For more mild temperatures, I’d recommend a late October/November trip or an early spring visit.